I prefer to leave the paintings to speak for themselves. I hope that my painting has the impact of giving someone, as it did me, the feeling of his own totality, of his own separateness, of his own individuality. Any art worthy of its name should address ‘life’, ‘man’, ‘nature’, ‘death’ and ‘tragedy’. 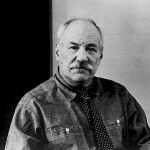 Barnett Newman was an American artist. He is seen as one of the major figures in abstract expressionism and one of the foremost of the color field painters. Newman was born in New York City, the son of Jewish immigrants from Poland. He studied philosophy at the City College of New York and worked in his father's business manufacturing clothing. He later made a living as a teacher, writer and critic. From the 1930s on he made paintings, said to be in an expressionist style, but eventually destroyed all these works. Newman died in New York City of a heart attack in 1970.